Musii is a completely self-contained, portable unit that needs no extra equipment or training to operate. Musii has been designed and approved for use within an SEN environment. The body is made from a reinforced MDF cylinder upholstered with foam and wipe clean PVC. It stands on 6 lockable castors. The inflatable component is made from soft but strong Rip Stop nylon as is used for sails and can zip on and off for cleaning or replacing. A spare zip on inflatable is provided with every Musii. 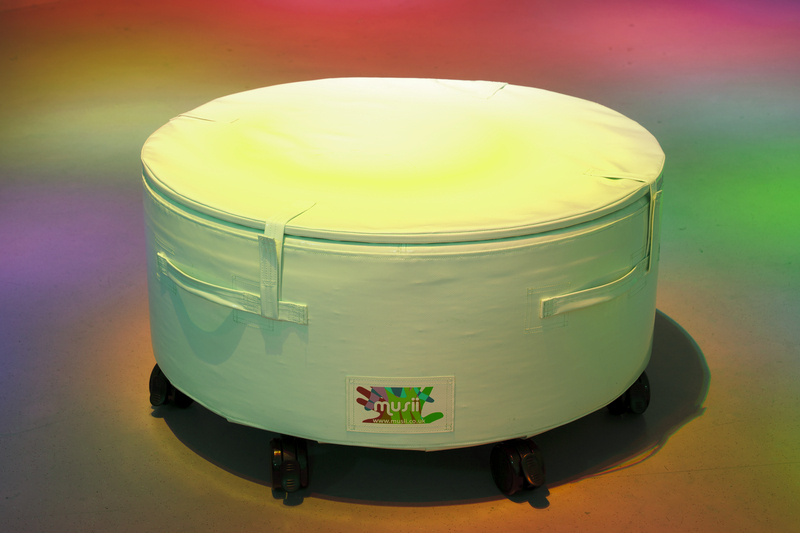 Under the inflatable, beneath a shatter-proof polycarbonate plate, is an array of three sensors and corresponding colour changing LED lighting modules. directional and can be felt though the skin of the inflatable. This gives Musii a vibro-acoustic quality. Sound volume and other settings can be selected with the touch screen remote control. 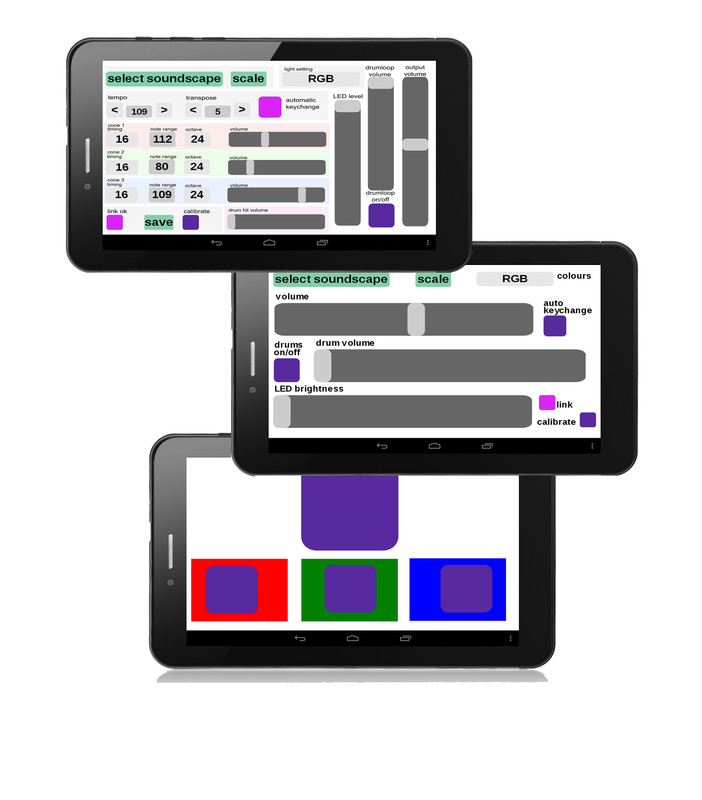 This gives the user a choice of three screens depending on the amount of control wanted. Sounds are selected by name in a drop down list and the user has control of features such as scale, tempo, note range, LED brightness and lots more. The simple remote shown at the bottom of the picture is aimed at children, letting them change sounds and pick colours with the large colour buttons. There are a currently over 50 soundscapes to choose from and we are regularly adding new ones into the library. Software and the soundscape library updates will be freely available to download. For full control of all of musii’s settings and detailed editing or creation of your own sounds then you can simply attach a keyboard, mouse and monitor to access Musii’s software. If you require it we can supply Musii with a Midi interface to enable connection to external devices such a iPads or synthesisers. The basic concept of Musii Mo is that when a cone is compressed or bent the sensors inside translate this to musical notes and coloured light. The lower down you depress the cone the higher the pitch of the notes and the brighter the colour. The user can only play notes in predefined musical scale that is set within the active sound scape so you cannot play out of tune, it also is quantized, which means it restricts note timing so notes can only be played in time. 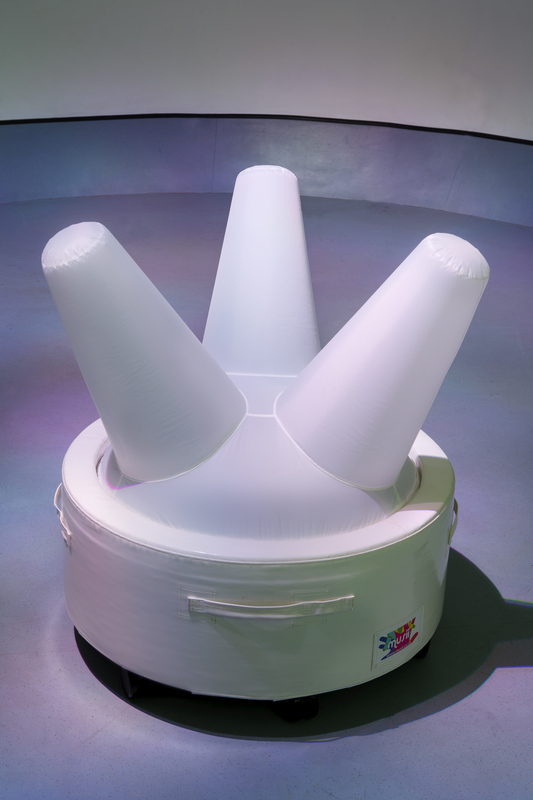 Each cone has its own corresponding sound and colour. The range of notes played as well as the timing can be different for each cone. How can Musii be used? Musii has been designed for developmental play in the SEN sector but can be enjoyed by anyone, young or old. The multi-sensory experience of playing Musii has many therapeutic possibilities including encouraging movement, development and awareness of proprioception, turn taking, cause and effect, creativity, expression and communication. It can be used for stimulation or for calming. The synchronised sound and lighting as well as the visual and tactile feedback of the inflatable enable a deeper understanding of the music you are making.